I finished reading this weekend a book I strongly recommend to anyone interested by sustainable development and energy as it is packed with figures and findings that are due to start discussions among CleanTechies. One of the main findings of this book is that electrifying our cars and installing heat pumps in our buildings would enable us to cut significantly both our greenhouse gases emissions and fossil fuels consumption. Both solutions are much more efficient than current ones and could benefit from massive electrification to answer all our energy needs. On sustainable electricity, the author notes that the UK and Europe in general can’t count solely on renewables. Indeed we see in the book that wind, biofuels, hydro, solar PV and others don’t add up enough energy to answer our current needs and even less the future needs with an electrified transport sector. So we need a plan that adds up with either concentrated solar elsewhere (like the Desertec project) or nuclear or both solutions. Clean coal may also add up enough electricity if proved viable. On North America (Mexico, the United States and Canada) the author notes it should first and foremost decrease energy consumption from 250 kWh per person per day to current European or Japanese levels of 125 kWh. This halving of their energy consumption could enable them to rely solely on renewables and the installation of concentrated solar in its deserts and nuclear. With European consuming the equivalent of 125 kWh per day per person we see a breakdown of transport accounting for 40 kWh per day, heating for another 40 kWh. Delivered electricity amounts to 18 kWh but due to the inefficiencies of the system this comes from 45 kWh of energy. With efficiency we could go from the current 125 to around 80 kWh, a figure similar to Hong Kong. It is worth noting that his simplification for the sake of the argument doesn’t take into account industry, agriculture or “stuff”, which are tackled in details in the book. Clean coal 16 kWh per day per person, nuclear 16, tide and wave 5.7, hydro 0.1, waste 1.1, pumped heat 12, wood 5, solar thermal 1, biofuels 2, solar PV 3 and wind 8. The four other give more or less importance to each of these energy sources. In one plan nuclear accounts for 44 kWh when in another plan wind energy accounts for 32 kWh. High speed rail and other alternatives also have to be pushed forward. A full high speed train indeed consumes as little as 3 kWh per passenger and biking even less: 1 kWh. 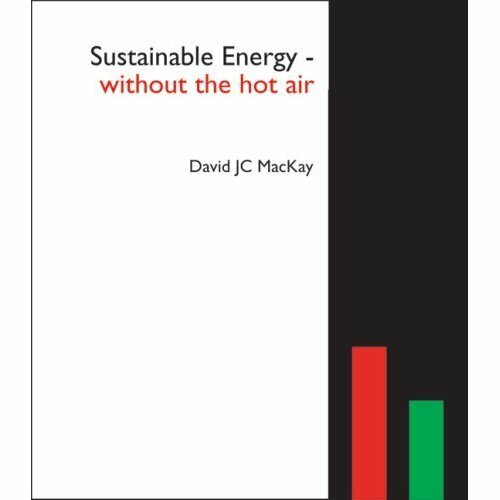 Concerning housing and buildings, the author is an advocate of both retrofitting and reducing the winter thermostat from 20°C to 17°C which alone bring savings of heating by 30 percent (page 292). By combining both solution David MacKay halved his heating bills. With a coefficient of performance (COP) of 4 to 5 heat pumps retrieve the heat contained in the outside air or soil and distribute it indoors. Another advantage of this solution is that it could bring air conditioning during hotter days. The author provides a lot of data on sustainable nuclear with thorium, fast breeder reactors and uranium from the oceans. I will soon dedicate another post to this special chapter. The book is available for free on the official website. You can download it in one document or read it per chapter. The paper version can be bought for around 22€. Published this year it is up to date and explains simply but most effectively – and humor – how we can go for low carbon energy solutions to answer all our needs. Grade : 20/20. A must read. Re-readability : Maximum as it brings a lot of data. An article on the BBC from the author. Most interesting. Edit on September 13th, 2016. Added banner. Image credits: Flickr, Kim Hansen.